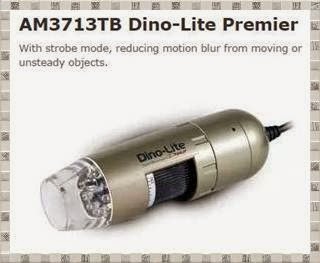 2R Hardware & Electronics: AM3713TB Dino-Lite Premier (Strobe Lighting). With strobe mode, reducing motion blur from moving or unsteady objects. The Dino-Lite Premier model AM3713TB digital handheld microscope with our strobomicroscope mode feature that takes perfect pictures each time by reducing motion blur while under magnification. Use it for monitoring production lines in a manufacturing environment, or observing a tadpole in a laboratory. Shaky or moving objects are ideal environments to utilize the AM3713TB strobosmicroscope mode feature. It will maintain a refresh rate of 60fps under any condition. A handheld digital microscope is a great tool to instantly see magnified objects right on your computer screen. You can take pictures, record video and also annotate right away. With the AM3713TB strobosmicroscope mode, you can also capture fast moving objects as well as ease of use providing a unique microscope experience. When the strobomicroscope mode is off, it still can maintain a refresh rate of 60fps whether the LED lights are on or off.